Stacked y, J, H and K band image from the UKIDSS Large Area Survey, with contours from the 1.4 GHz VLA map (Saxena et al., 2018) overplotted for TGSS1530. Credit: Saxena et al., 2018. An international team of astronomers has detected a new high-redshift radio galaxy (HzRG). The newly identified HzRG, designated TGSS1530, was found at a redshift of 5.72, meaning that it is the most distant radio galaxy known to date. The finding is reported in a paper published June 4 on arXiv.org. High-redshift radio galaxies, which are among the most massive galaxies at their redshift, are known to contain large amounts of dust and gas. HzRGs are often located at the center of clusters and proto-clusters of galaxies. They could provide insights into the assembly and evolution of large scale structures in the universe. Astronomers are particularly interested in finding new HzRGs at redshifts higher than 6.0, which are therefore from the so-called epoch of reionization – an early stage of the evolution of the universe, during which the cosmic gas went from neutral to ionized. Such radio galaxies could be used as unique tools to study the process of reionization in detail. Recently, a group of researchers led by Aayush Saxena of the Leiden Observatory in the Netherlands, has found a new HzRG in the TIFR GMRT Sky Survey (TGSS) Alternative Data Release 1 (ADR1). In order to confirm the discovery, they conducted follow-up observations of this galaxy in April 2017 using the Gemini Multi-Object Spectrographs (GMOS) on the Gemini North telescope in Hawaii. Afterward, in February and May 2018, they carried out observations by employing the LBT Utility Camera in the Infrared (LUCI) on the Large Binocular Telescope (LBT) in Arizona. What they found is a new radio galaxy at a redshift of 5.72, hence close to the end of the epoch of reionization. "In this paper, we report the discovery a radio galaxy at a redshift of z = 5.72, TGSS1530, which was pre-selected as part of our sample of high-redshift radio galaxy candidates," the researchers wrote in the paper. According to the study, TGSS1530 has an estimated size of approximately 11,400 light years – a value typical for radio galaxies at high redshifts. When it comes to its radio properties, they are comparable to other known radio galaxies at redshifts over 4.0. The researchers suggest that the high redshift of TGSS1530 together with relatively small radio and Lyman-alpha sizes may indicate that it may be a radio galaxy in an early phase of its evolution. Additionally, the astronomers found that the radio luminosity of TGSS1530 calculated at 150 MHz is 29.1 W/Hz, which places it at the most luminous end of the radio luminosity function at this epoch. In concluding remarks, the authors of the paper noted that although TGSS1530 is a radio galaxy with the highest observed redshift, this could soon change with more sensitive, large-area surveys currently underway, such as the LOFAR Two-metre Sky Survey (LoTSS). Such surveys could be capable of detecting the first radio galaxy at a redshift higher than 6.0. "Discovery of even a single bright radio galaxy at z > 6 would open up new ways to study the epoch of reionization in unparalleled detail, through searches for the 21cm absorption features left behind by the neutral hydrogen that pervaded the Universe at high redshifts," the astronomers concluded. We report the discovery of the most distant radio galaxy to date, TGSS1530 at a redshift of z=5.72 close to the presumed end of the Epoch of Reionisation. 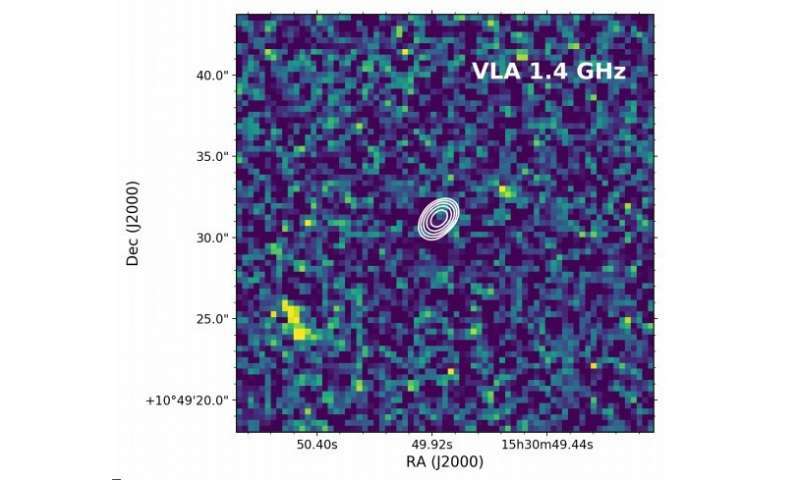 The radio galaxy was selected from the TGSS ADR1 survey at 150 MHz for having to an ultra-steep spectral index, α150 MHz1.4 GHz=−1.4 and a compact morphology obtained using VLA imaging at 1.4 GHz. No optical or infrared counterparts for it were found in publicly available sky surveys. Follow-up optical spectroscopy at the radio position using GMOS on Gemini North revealed the presence of a single emission line. We identify this line as Lyman alpha at z=5.72, because of its asymmetric line profile, the absence of other optical/UV lines in the spectrum and a high equivalent width. With a Lyα luminosity of 5.7×1042 erg s−1 and a FWHM of 370 km s−1, TGSS1530 is comparable to 'non-radio' Lyman alpha emitters (LAEs) at a similar redshift. However, with a radio luminosity of logL150 MHz=29.1 W Hz−1 and a deconvolved physical size 3.5 kpc, its radio properties are similar to other known radio galaxies at z>4. Subsequent J and K band imaging using LUCI on the Large Binocular Telescope resulted in non-detection of the host galaxy down to 3σ limits of J>24.4 and K>22.4 (Vega). The K band limit is consistent with z>5 from the K−z relation for radio galaxies, suggesting stellar mass limits using simple stellar population models of Mstars<1010.5 M⊙. Its high redshift coupled with relatively small radio and Lyα sizes suggest that TGSS1530 may be a radio galaxy in an early phase of its evolution. What is empirically known about the shape and size of the uUniverse? They hint at it in the article, as being towards the end of the epoch of reionization. The end of that epoch was ~ 1 billion years after the big bang, so ~ 13 billion light years for the galaxy. Just had a look at the paper, and z = 5.72 is ~ 0.97 Gyr after the big bang. So, ~ 12.8 billion light years. What is your diet like? How many hours of sleep do you get a night? Do you have an apple every day? How often do you wash your hands? Exercise? Change your underwear? What is your secret?